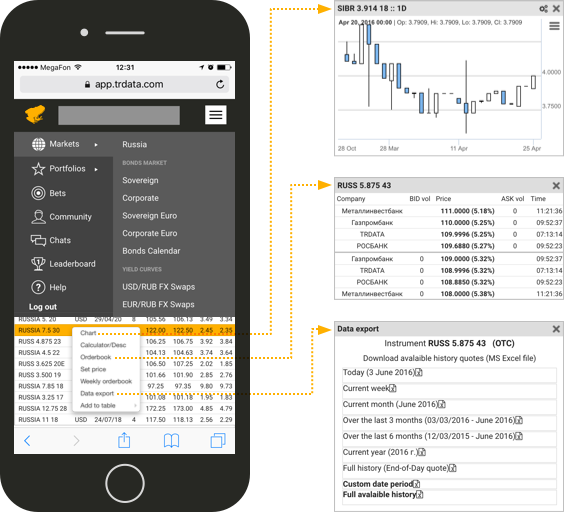 All bonds and currency prices can be in viewed their respective widgets in real-time. All RSS feeds from and analytics from our news providers and users can be read directly on mobile. Select the orderbook of a bond to view all prices and who they were sent by. Keep in mind only verified financial professionals can see all price providers. From the bond menu, you can view and download graphs of the desired instrument. This function allows you to export historical prices of individual bonds for the day, week, month, year or all time. The same can be done with currencies. Log in to trdata.com from your phone and let our team know what you think! We are always looking for ways to optimize the user experience and value your feedback. *Note: some features are only available for premium clients. Contact our TRDATA representative pavel.fedorov@trdata.com to get full access to TRDATA today.